St. Mary Interparochial School belongs to the Archdiocesan Catholic Youth Organization (CYO). CYO programs encourage partnerships among parents coaches, priests, religious, teachers and other dedicated adults in the management and support of sports programs for youth. CYO is just one component of a comprehensive youth ministry that mentors young people as they grow in their relationship with God and come to better understand themselves and the Catholic faith. All St. Mary’s athletes learn to play hard and recognize the values of respect and grace when winning and courage and self-reflection when losing. Competitive athletic teams for grades 6, 7 and 8 are organized in volleyball, basketball (also offered to fifth grade students), softball and baseball. Students who are interested in playing are encouraged to sign up. The Storm teams play competitively under the guidance of parents who volunteer their time, energy, talents and resources. Coaches are committed to help our budding athletes learn about teamwork and collaboration, improve their skills and knowledge of the games, set challenging goals, get great exercise, and most of all to have some fun! Athletic forms for students and parents may be found here. 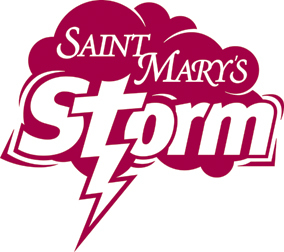 We encourage parents to consider coaching our teams.Parents who are interested in coaching or assisting for the team please contact Harry Kane, St. Mary Director of Athletics, at storm@saintmarys.us. All coaches are required to have the appropriate clearances. Please visit the Office of Child and Youth Protection's website to start the process. At the end of each school year, athletes and coaches celebrate each team’s accomplishments at a special Sports Night Banquet hosted by the Home and School Association. For more information, please email Harry Kane at storm@saintmarys.us. St. Mary School offers students in grades 5-8 with the opportunity to compete in a CYO Girls Volleyball league. Each fall two teams are organized to represent St. Mary School. Our teams compete against other Catholic elementary schools throughout Philadelphia. St. Mary School offers students in grades 5-8 with the opportunity to compete in a CYO Boys and Girls Basketball league. Each winter teams are organized to represent St. Mary School. Our teams compete against other Catholic elementary schools throughout Philadelphia. St. Mary School offers students in grades 6-8 with the opportunity to compete in a CYO Girls Softball league. Each spring a team is organized to represent St. Mary School. Our teams compete against other Catholic elementary schools throughout Philadelphia. St. Mary School offers students in grades 6-8 with the opportunity to compete in a CYO Boys baseball league. Each spring a team is organized to represent St. Mary School. Our teams compete against other Catholic elementary schools throughout Philadelphia.